Part II includes the Division Overview, and Accomplishments and Planned Projects. Part III includes the 2017 Bridge Capital Program, Flag Conditions, Inventory, Glossary, and suggested reading. Part IV includes the 2017 Inventory location maps. Download the entire 2017 report (59.7 MB). Part III includes the 2016 Bridge Capital Program, Flag Conditions, Inventory, Glossary, and suggested reading. Part IV includes the 2016 Inventory location maps. Download the entire 2016 report (23 MB). Part III includes the 2015 Bridge Capital Program, Flag Conditions, Inventory, Glossary, and suggested reading. Part IV includes the 2015 Inventory location maps. 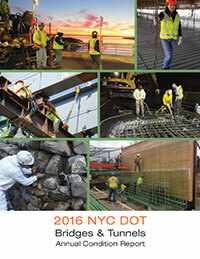 Download the entire 2015 report (27.7 MB). Part II includes the Division Overview, 2014 Chronology, and Accomplishments and Planned Projects. 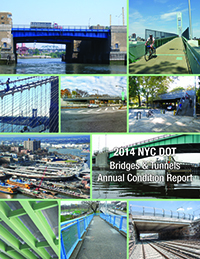 Part III includes the 2014 Bridge Capital Program, Flag Conditions, Inventory, Glossary, and suggested reading. Part IV includes the 2014 Inventory location maps. Download the entire 2014 report (33.8 MB). Part II includes the Division Overview, 2013 Chronology, and Accomplishments and Planned Projects. Part III includes the 2013 Bridge Capital Program, Flag Conditions, Inventory, Glossary, and suggested reading. Part IV includes the 2013 Inventory location maps. 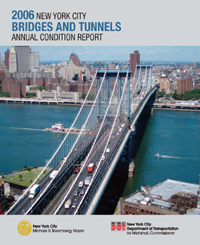 Download the entire 2013 report (28.5 MB). Part II includes the Division Overview, 2012 Chronology, and Accomplishments and Planned Projects. 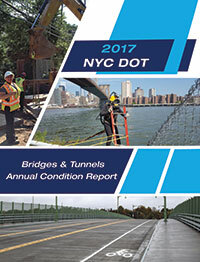 Part III includes the 2012 Bridge Capital Program, Flag Conditions, Inventory, Glossary, and suggested reading. Part IV includes the 2012 Inventory location maps. 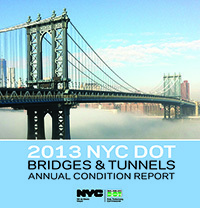 Download the entire 2012 report (8.9 MB). Part II includes the Division Overview, 2011 Chronology, and Accomplishments and Planned Projects. Part III includes the 2011 Bridge Capital Program, Flag Conditions, Inventory, Glossary, and suggested reading. Part IV includes the 2011 Inventory location maps. 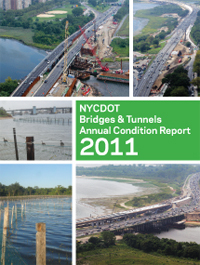 Download the entire 2011 report (50 MB). Part II includes the Division Overview, 2010 Chronology, and Accomplishments and Planned Projects. Part III includes the 2010 Bridge Capital Program, Flag Conditions, Inventory, Glossary, and suggested reading. Part IV includes the 2010 Inventory location maps. 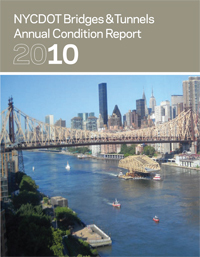 Download the entire 2010 report (22 MB). Part I includes the Commissioner's Message, Acknowledgments, Executive Summary, Division Overview, and 2009 Chronology. Part II includes 2009 Accomplishments and Planned Projects. Part III includes the 2009 Bridge Capital Program, Flag Conditions, Inventory, Glossary, and suggested reading. Part IV includes the 2009 Inventory location maps. 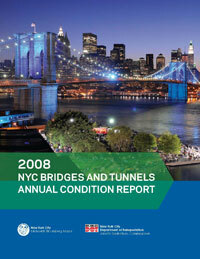 Download the entire 2009 report (21 MB). Part I includes the Commissioner's Message, Acknowledgments, Executive Summary, Division Overview, and 2008 Chronology. Part II includes 2008 Innovations and Accomplishments. 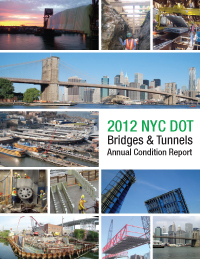 Part III includes the 2008 Bridge Capital Program, Flag Conditions, 2008 Inventory, Glossary, and suggested reading. Part IV includes the 2008 Inventory Location Maps. Download the entire 2008 report (20 MB). Part I includes the Commissioner's Message, Acknowledgments, Executive Summary, Division Overview, and 2007 Chronology. Part II includes 2007 Innovations and Accomplishments. Part III includes the 2007 Bridge Capital Program, Flag Conditions, 2007 Inventory, Glossary, and suggested reading. Part IV includes the 2007 Inventory Location Maps. Download the entire 2007 report (18 MB). Part I includes the Commissioner's Message, Acknowledgments, Executive Summary, Division Overview, and 2006 Chronology. Part II includes 2006 Innovations and Accomplishments. 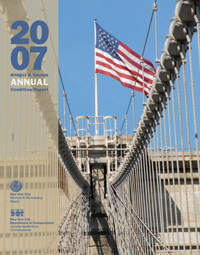 Part III includes the 2006 Bridge Capital Program, Flag Conditions, 2006 Inventory, Glossary, and suggested reading. Part IV includes the 2006 Inventory Location Maps. 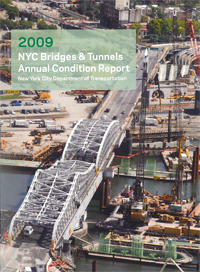 Download the entire 2006 report (16 MB). Part I includes the Commissioner's Message, Acknowledgments, Executive Summary, Division Overview, and 2005 Chronology. Part II includes 2005 Innovations and Accomplishments. 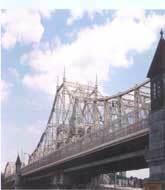 Part III includes the 2005 Bridge Capital Program, Flag Conditions, 2005 Inventory, Glossary and suggested reading. Part IV includes the 2005 Inventory Location Maps. Download the entire 2005 report (14 MB). Part I includes the Commissioner's Message, Acknowledgments, Executive Summary, Division Overview, and 2004 Chronology. Part II includes 2004 Innovations and Accomplishments. Part IV includes the 2004 Inventory Location Maps. Download the entire 2004 report (13 MB). Part I includes the Commissioner's Message, 2003 Executive Summary, 2003 Division Overview, and 2003 Chronology. Part II includes 2003 Innovations and Accomplishments. 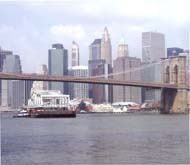 Part III includes the 2003 Bridge Capital Program, 2003 Flag Conditions, 2003 Inventory, Glossary, and suggested reading. Part IV includes the 2003 Inventory Location Maps. Download the entire 2003 report (18 MB). Part I includes the Commissioner's Message, 2002 Executive Summary, 2002 Division Overview, and 2002 Chronology. Part II includes 2002 Innovations and Accomplishments. Part III includes the 2002 Bridge Capital Program, 2002 Flag Conditions, 2002 Inventory, 2002 Glossary and suggested reading. Part IV includes the 2002 Inventory Location Maps. Download the entire 2002 report (11 MB). Download the entire 2001 report (11 MB). Download the entire 2000 report (11 MB).